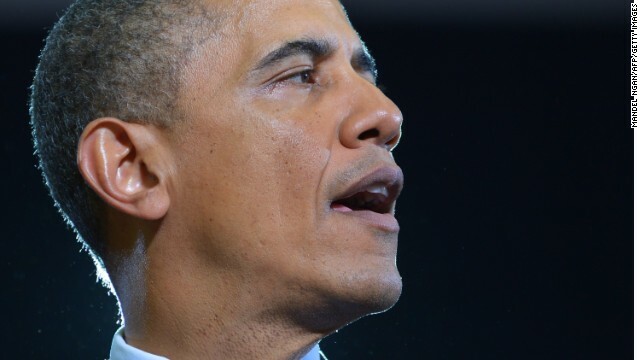 (CNN) - President Barack Obama on Friday chided recent state efforts to enact tougher abortion laws and became the first sitting president to address Planned Parenthood when he spoke at a gala for the group. "When politicians try to turn Planned Parenthood into a punching bag…When they talk about cutting off funding, let's be clear, they're talking about telling many of those women, you're on your own. They're talking about shutting those women out at a time when they may need it most." Notably absent from his remarks was mention of the high-profile murder trial underway of Kermit Barron Gosnell, a Philadelphia doctor accused of performing illegal late-term abortions. Gosnell faces four first-degree murder counts. Authorities allege that some of the infants were born viable and alive during the sixth, seventh and eighth months of pregnancy, but were killed with scissors that were used to cut their spinal cords. The anti-abortion group Susan B. Anthony List responded to the president's remarks. "President Obama blatantly ignored this inconvenient truth about the abortion industry's horrific lack of oversight, and disparaged the pro-life advocates who wake up each morning with the goal of saving the lives of unborn children and women from the pain of abortion," Marjorie Dannenfelser, the group's president, said in a statement. White House Press Secretary Jay Carney said earlier this month that while Obama was "aware" of the case, "the president does not and cannot take a position on an ongoing trial." Friday's event was held to honor Los Angeles Mayor Anthony Villaraigosa, HBO 'Girls' creator Lena Dunham and Dr. Ruth Westheimer. Dunham starred in a controversial web video for Obama's campaign last year, in which she compared a person's first time voting to losing one's virginity. After Newtown Obama said that we must put greater controls on guns for the sake of the children, to protect the children. If he really wants to protect the children, then why does he condone abortion? Why do children who are killed by guns have more value than children who are killed by abortion? Planned parenthood: founded by Margaret Singer, who founded the eugenics movement, which was the agenda to kill all handicap babies, and black babies. Today it does the same, and liberals argue for their right to take away rights from babies being formed in the womb. A liberal believes murder is justified for convenience. It is also justified for pleasure. Abortions just make women pathetic mothers to dead babies. Continue to fight for the right to kill liberals. Just understand God is already judging you. And understand you always have a choice to keep your legs closed. Don't use raped women as an excuse to murder when you weren't raped. As far as people that dump babies in trash cans. They are murderers, just like those who have abortions for pleasure. "If it saves one life we have an obligation to try" the most hypocritical president in history. More children die every year from abortions than guns yet no agenda to slow them down. Why is it everyone who is against guns uses "to protect the children" but are hell bent on continuing abortions? My tax dollars going to something I don't agree with (a lot like food stamps for illegal's) because two people can't be responsible to put on a condom, or use some other form of birth control. Do the fathers of these fetuses have a say in the murder of thier unborn child? Think on that. Have all the abortions you want and butcher all the babies that you want in the name of "women's rights". I couldn't care less. Stop asking me to pay for it!!!!!!! I disagree with President Obama. Planned Parenthood needs to go away! "PP is a facade for taxpayer-funded abortions." The Hyde Amendment bans taxpayer funding for abortion and has for decades. PP provides so many badly-needed health services... including prenatal care. Abortion is quite far down the list of the services it provides. It's truly sad that our President advocates the murder of unborn children. Ladies it's not about your rights at all, that's just an excuse used because you made an irresponsible choice. Don't put your self in that position and you won't have anything to worry about, plain and simple. For those of us educated enough to understand the concept of exponential growth and decline; How can the human race continue to exist with current living standards if birth control methods and abortions are not available? Can the planet support 14 Billion? 28 billion? This is not about Jesus. It's about math. This is truely a disgrace! President should protect ALL his people. If you were not a human baby at 6 weeks of your life, what were you doing in your mother's womb? It takes a while before the baby will become a productive citizen and send a check to the IRS, but eventually it will be more than his mother payed for the abortion, so if the president was looking for fast cash, because of needed founds for presidential campaign and only a short reign at the W. H. maybe this is what motivates him, PP and all it's supporters? In the end it must be all about the money, otherwise who would kill their own child or support that idea? When the law singles out a person for punishment over a privately committed communal crime( involving a man, woman, societally condoned practice, the medical personnels whose duties are to save life, governance problems that cause poverty, etc ) that arose from unpreventable mistake, where then is the justice. Is such law not discriminatory. If over a third of the society is involved how do you justice the 'stone casting'.......and what should happen to the rest people who aided the crime. endangered animals....we must protect them.......the elderly.....they need our help.....victims of unjust war and torture....no problem, they deserve our help too......fetuses with heart beats in a woman.....of course not, that's not life.....one day America will overcome it's hypocrisy and cherish all life in all its forms, from the cradle to the grave, its the only spirituality that makes any sense....everyone counts, or no one counts. women have the right to chose what they want to do no one should try prohibit them from that or from takimg care themselves. Plan parnethood help msny women domt have insurance cant afford it. people should be more supportive of it and for those pro life if women want to have abortions they have the right. it there body and life they can do whatever they want. Yeah so why make certain MediCal patients unable to get an iud from their MediCal paid doctor? Abortion is wrong no matter how beautiful they try to make it...the fact is that a little baby died. When an adult has passed away, what is the first thing they do to determine death? They check for a pulse. And whether or not the heart is beating determines the outcome. The other health services such as cancer screenings, well checks are awesome, but not abortion.